Santa Cruz, CA, February 10, 2015 – After the Jewish community suffered two hate crimes at UC Davis in recent days, 23 organizations with hundreds of thousands of members and supporters demanded UC Davis Chancellor Katehi conduct a formal investigation into registered student group Students for Justice in Palestine (SJP) and one of its members, Azka Fayyaz, also a UC Davis student senator. On January 29, the UC Davis student government passed an anti-Israel divestment resolution written and promoted by SJP. A video of the meeting shows Jewish and pro-Israel students were heckled with loud chanting of “Allahu Akbar.” Later that evening, Fayyaz celebrated the passage of the resolution on Facebook with photos and postings that promoted violence against Jews, the destruction of Israel and terrorism. Just days after the meeting, a Jewish fraternity at UC Davis was spray painted with swastikas. In addition, anti-Semitic graffiti was discovered at the Hillel House. Authorities said a janitor found the words, “grout out the Jews,” etched into the bathroom wall. Section 102.24: Expressing intent to terrorize other students, faculty and staff who are Jewish and support the State of Israel. 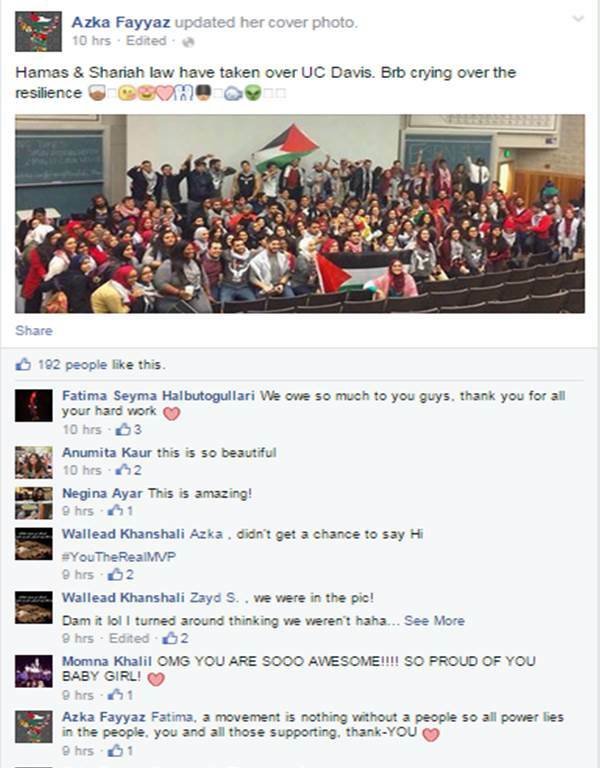 The groups also urged Katehi to issue a strong public condemnation of the SJP and the conduct of its members. “With anti-Semitism rising at an alarming rate around the world and right here in the U.S., it is more critical than ever that you continue to send the message to the university community that while UC Davis supports free speech and the robust exchange of ideas, it will not tolerate anti-Semitism or any other form of hate and bigotry,” added the groups. A copy of today’s letter with a full listing of the organizations that sent it can be found HERE and below. We are 23 organizations with hundreds of thousands of members and supporters who are deeply concerned about recent anti-Semitic incidents at UC Davis, which are creating a hostile campus environment for Jewish and pro-Israel students. While we commend you for already taking some important steps in addressing these problems, we urge the university to conduct a full investigation into the conduct of the registered student group called Students for Justice in Palestine (SJP) and one of its members, Azka Fayyaz. We believe that the investigation will reveal that both the SJP and Ms. Fayyaz have violated university policies and fostered divisiveness, hatred and bigotry on campus in violation of the Principles of Community. They should be held accountable for their misconduct. We commend you for your strong public condemnation of the anti-Semitic vandalism, and your call for a police investigation of the vandalism as a hate crime. But we believe that more can and should be done, so that Jewish students will feel safe and welcome at UC Davis, and your university will not continue to be tainted by hate and bigotry. We understand that unfortunately there has already been yet another act of anti-Semitic vandalism at the Hillel House across from your campus. Conduct a full investigation into the conduct of the SJP and Azka Fayyaz, consistent with university policies. We believe that the investigation will substantiate that they have engaged in conduct that (1) threatens the health and safety of Jewish and pro-Israel students in violation of Section 102.08 of the Policies Applying to Campus Activities, Organizations and Students(“Policies”); (2) harassed other students in violation of Section 102.09 of the Policies; (3) disturbed the peace at the student government meeting on January 29th, in violation of 102.15 of the Policies; and (4) expressed an intent to terrorize other students, faculty and staff who are Jewish and support the Jewish State of Israel, in violation of Section 102.24 of the Policies. 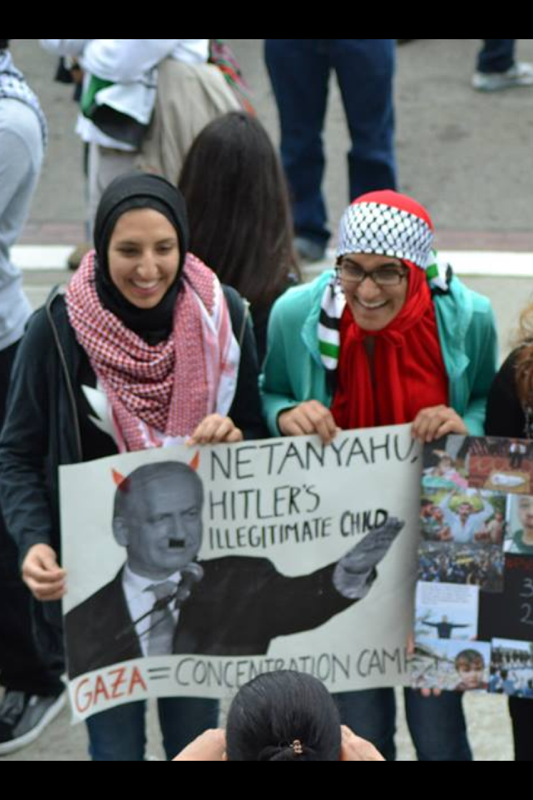 In addition, their conduct has made a mockery of the university’s guiding Principles of Community: Instead of fostering a climate of mutual understanding, respect and civility, the SJP and Fayyaz have been divisive, hateful and bigoted. 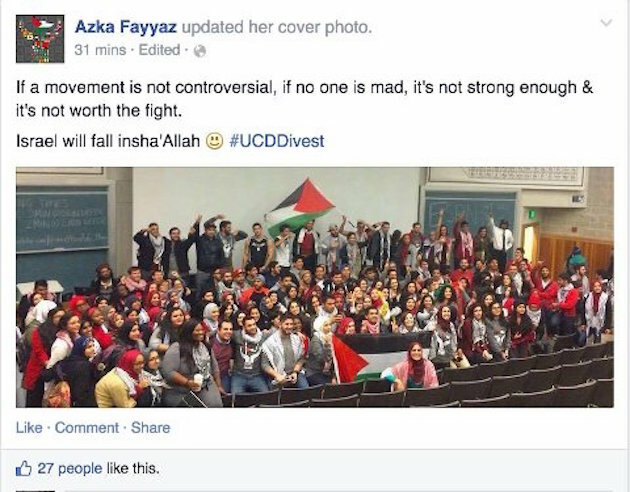 If, as we expect, the evidence substantiates the wrongdoing of the SJP and Azka Fayyaz, then they should be disciplined, consistent with university policies. Ms. Fayyaz should be removed from her position in the student senate, since her hateful anti-Semitic conduct does not serve the student body she was elected to represent. The SJP’s registration should be revoked and it should lose all group privileges on campus, until it can demonstrate that, like other student groups, it can conform its conduct to the university’s rules and the Principles of Community. Issue a strong public condemnation of the SJP and the conduct of its members. With anti-Semitism rising at an alarming rate around the world and right here in the U.S., it is more critical than ever that you continue to send the message to the university community that while UC Davis supports free speech and the robust exchange of ideas, it will not tolerate anti-Semitism or any other form of hate and bigotry. Hateful and divisive groups like the SJP need to finally get the message that the university will not tolerate harassing, intimidating or threatening conduct, and that the SJP and its members will be held to the same rules and standards as everyone else. As you surely know, federally funded universities like UC Davis are required under Title VI of the Civil Rights Act to ensure that Jewish students are afforded a campus environment that every student is entitled to – one that is physically and emotionally safe and conducive to learning. We are counting on you to continue to show strong leadership in furtherance of this legal and moral imperative.